I don't know how effective that would be in real life, but it certainly looks cool. 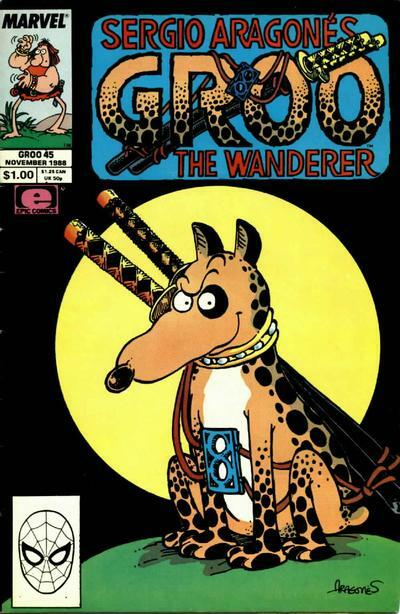 Yep, this is another pretty good issue of the series, if a bit light on gags about frays, cheese dip, and mendicants. But there's always next issue for those. 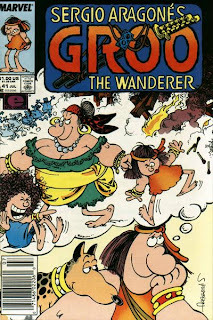 Next: "The Death of Groo"
Moral: "Everyone's life seems easier from the outside." 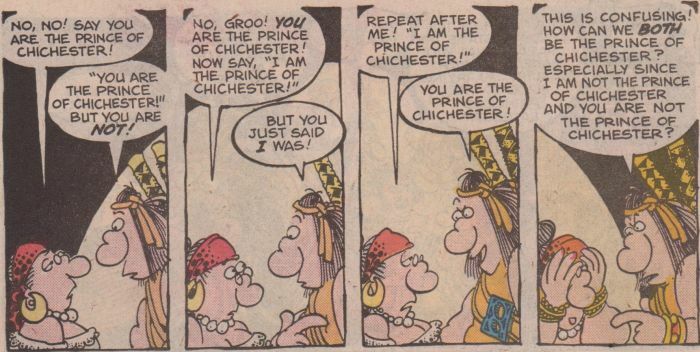 Groo also remembers that he is the Prince of Chichester. Letter column jokes: When reader Lon Wolf confesses that Groo's reunion with Rufferto in issue #39 made him cry, Mark responds by listing things that make the Groo Crew do the same: Stan Sakai's paycheck, Tom Luth's coloring duties, and long specials in which the Minstrel rhymes in every panel for Mark. Mark says there are 81 separate things that make the Groo Crew cry, then when another reader asks for the definition of mulch, he updates the number to 82. 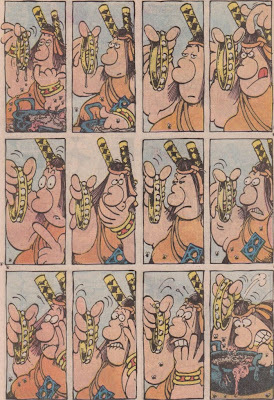 When reader Doug Green asks why Groo's nose looks like a jelly bean and Arcadio's chin looks like a cucumber, Mark responds that it's due to "the strange Jelly-Bean-and-Cucumber Diet that Sergio has been on for the last seven years." 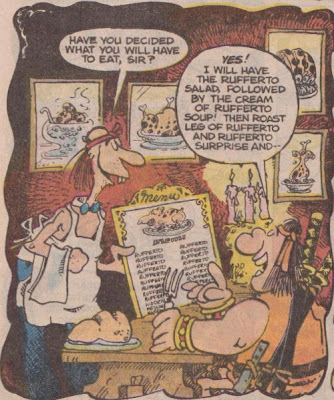 He's also allowed to eat black-eyed peas once a year, which explains the existence of Rufferto. Finally, when Benny Boucher sends a letter simply asking "Why? ", Mark answers with a long, jargon-filled paragraph about how that question has plagued philosophers for years, before concluding "Because." It's a nice contrast to the lengthy fantasy, but it's much too little to save the issue, which ends up being a tiresome exercise rather than a fun flight of fancy. That's probably to be expected here and there throughout the series, as the creative team would kind of go wherever their imaginations led them, and more often than not, they would wring great jokes out of it. Unfortunately, this is one of the times they didn't really do so, but luckily, it's definitely the exception rather than the rule. Moral: "Fantasy is a nice vacation, but reality is where you spend your life." Spanish words: The Sultans of Galleta and Canino are named after the words for "cookie" and "canine". Running jokes: There's a "Did I err? ", and I don't think I've mentioned this one before, but there's an example of the joke where somebody calls Groo a series of insulting names, and he responds, "Just what are you getting at?" 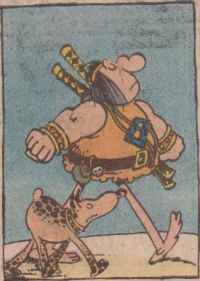 Letter column jokes: When reader Patrick Hayes comments that he's glad Groo confessed to liking Rufferto rather than running the idea of his dislike for the dog into the ground, Mark takes mock offense, saying that they have so few jokes, they have to milk them for every drop of humor. 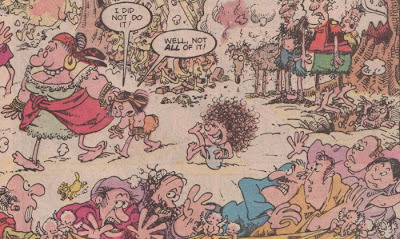 Well-known Groo fanatic Gary Grossman writes a letter composed almost entirely of words beginning with the letter G, and reader James Calloway finds a way around Mark's restriction against defining mulch by doing it in a letter. This issue cements my hate for Granny Groo when she, having decided she is unable to exploit her grandson, gets rid of him by selling him into slavery. What a swell lady. We learn in a flashback that this is a scheme she used to run when Groo was a kid, selling him to some family, then later sneaking him a potion that makes him sick so they will give him back. But this time, she has no intention of rescuing him; after receiving her payment, she waltzes off out of the book, hopefully to plague her kin no more (she does show up again in flashbacks, but I don't remember if she comes back in the "present"). 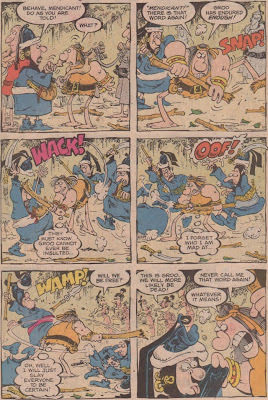 It's a weird little sequence, seemingly included to pad out the page count while the creative team was figuring out how to get rid of the monstrous Granny Groo. These multi-issue arcs in which characters get introduced or "major" events happen seem to have settled into a standard length of three issues, so this one is the finale, making for something of an awkward transition back to the status quo. 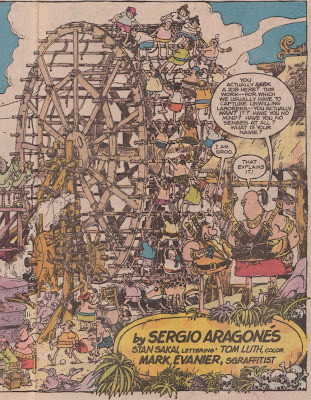 Good jokes still make their way into the story, and Sergio's art is as wonderful as ever, but it's becoming clear that at this point in the series' evolution, continuity is more of a hindrance than a boon. Hopefully the single-issue stories will continue to be the prevalent method of storytelling for a while yet. Recurring characters: Granny Groo, and Lil' Grooella gets another flashback appearance. Moral: "Friends are people who are there when you need them. 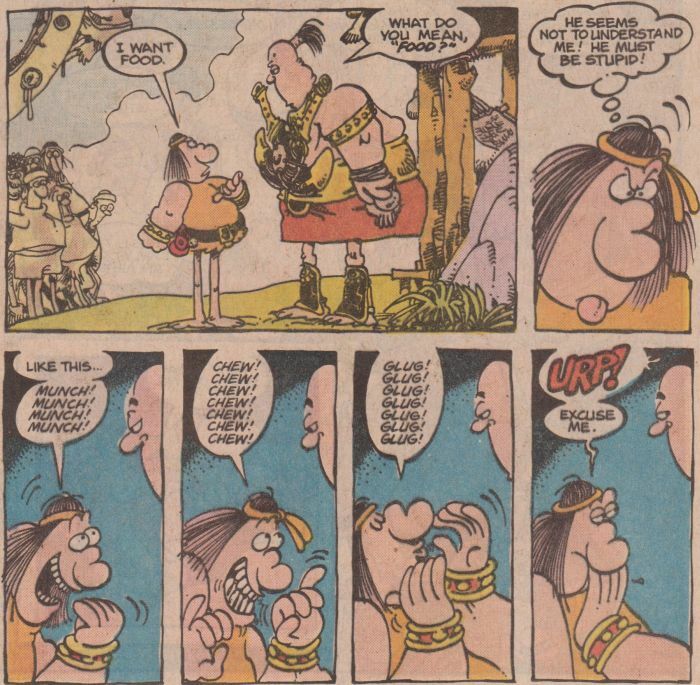 (Also applies to dogs)"
Running jokes: Groo sets a record for the longest gap (at least chronologically) between the initial statement and the "Say, what did she mean 'slow of mind'?" 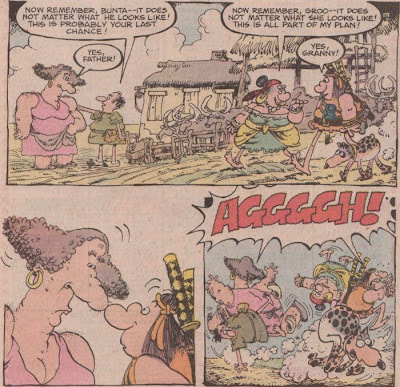 callback, with Granny Groo insulting him in a flashback, and Groo remembering it years later. Lil' Groo does some mulching. 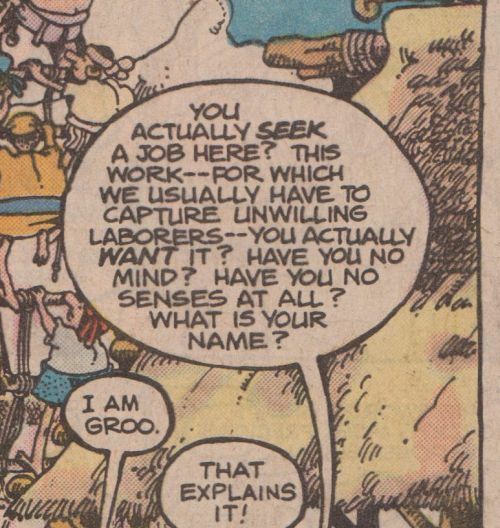 Groo gets called a mendicant. 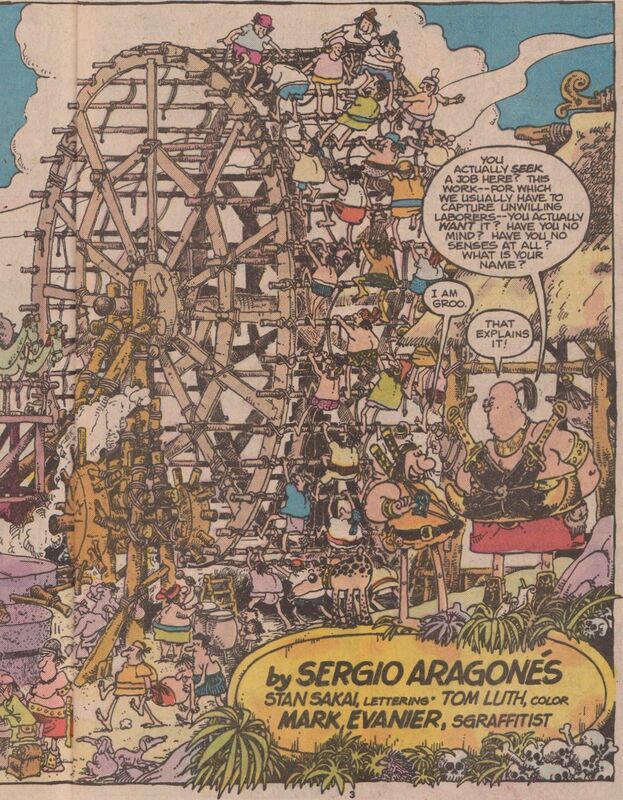 Letter column jokes: Reader Blake Vojta asks how many copies of Groo Sergio has signed, and Mark replies that unsigned copies are rarer than signed ones, and Sergio should save time and go to Sparta, Illinois, where the comics are printed, and sign each copies as it comes off the press. Reader J.A. 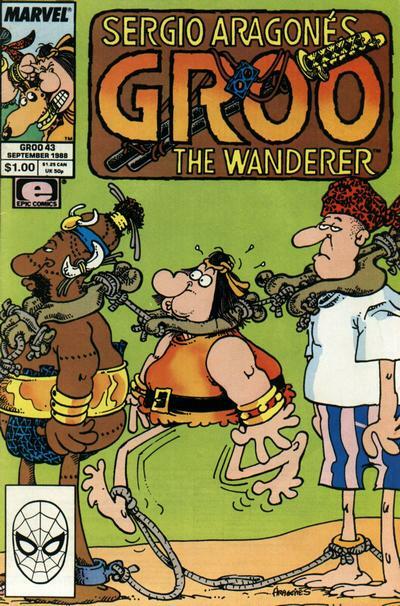 Todd rules out "video cassette" and "pop tart" as answers for the blue thing on Groo's chest, and decides it must be a carburetor gasket. He also asks what the stuff is in Sage's flask, which Mark declares is water, in hopes that it won't start another running joke (don't worry, it does anyway). 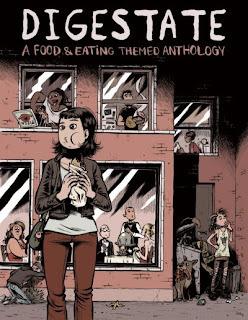 Judging by the title of this anthology, it's not only meant to be about food, but should hopefully give readers some ideas to consider, perhaps implanting them with, if not full-on change in the way they eat, at least a consideration of what they put into their body. That seems to be editor J.T. 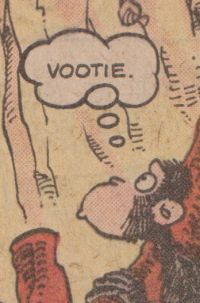 Yost's intent, at least, judging by the semi-confrontational nature of his piece. Of course, not all the contributors followed this direction. Actually, stories fall into one of three categories: autobiographical tales involving the cartoonist's relationship to food, issue-based looks at where food comes from and the morality of eating it, and other stories that happen to feature food in some respect. 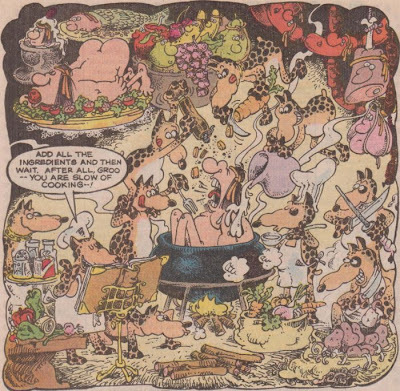 There are also a few illustrative pieces from the likes of Kevin Cannon, Danny Hellman, and John Kerschbaum, with the latter contributing pieces which open and close the book with a perfect evocation of the title, the inside front cover depicting a multitude of anthropomorphic foodstuffs marching into a gaping mouth, as if the book itself is chowing down on a huge meal, and the inside back cover matching it with a hilariously disgusting end result, an image that won't soon leave the mind of anyone who sees it. 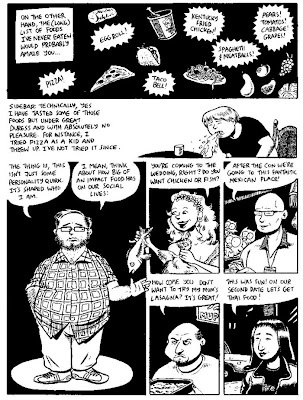 When it comes to the comics themselves, the autobiographical stories vary from standard descriptions of the kind of food the cartoonist ate as a child (Liz Prince, Jeremy Tinder, Ayun Halliday, Tod C. Parkhill, Alex Robinson), to relating food-related incidents (Noah Van Sciver, Pranas T. Naujokaitis, Nicole J. Georges, Jonathan Baylis and Lisa Rosalie Eisenberg, K. Thor Jensen, Ben Snakepit), to discussions of personal eating philosophies (Sam Henderson, James Kochalka, Al Ortiz, K. Thor Jensen, Hazel Newlevant, L. Nichols, Kieth Knight). By the end of the book, a lot of them seem to blend together, but some of them stand out, like Alex Robinson's discussion of his phobia about eating unfamiliar foods, Noah Van Sciver's funny story about the consequences of eating too much Raisin Bran, and Jeremy Tinder's story about getting in trouble as a kid for accidentally letting an entire freezer full of meat thaw out and leak blood everywhere. Marek Bennett's "Successful Slaughter!" is also quite good; an excerpt from his Coffee+Dumplings+Komiks book-in-progress about living in Slovakia, it relates an incident in which he went to a neighbor's house for a "slaughter", in which the family cut up and wrapped half of a bull, then cracked the bones open in order to use the marrow for soup, all while drinking vodka and chatting about subjects like the uselessness of the Hungarian language. Bennett depicts everyone as animals like rabbits or bears, but he gives the characters a nice expressiveness, and really communicates a lovely inter-personal atmosphere. The third category, that of stories that contain food in some aspect, is kind of hit or miss, ranging from the weird, somewhat impenetrable stories of Josh Bayer, J.T. Dockery, Aron Nels Steinke, Renee French, Sophia Wiedeman, and William Cardini, to the goofy gag comics of Sam Henderson and Dan Piraro, stories featuring anthropomorphic foods by Josh Burggraf and Minty Lewis, and fairly entertaining tales of slacker superheroes by Darryl Ayo and a doggy with a gross diet by Gary Fields. Adam Hines, creator of Duncan the Wonder Dog, has an ambitious story called "Last Thoughts From the Watchtower" that layers time-jumping imagery, narration taken from a Looney Tunes cartoon, and sidebar text involving a message from an immortal speck of a star, all adding up to a confusing whole that I kind of admired, even if I didn't really understand it. Victor Kerlow's story about a guy with a taco for a head encountering resistance when he tries to buy food from Taco Bell is amusing, and it fits the impetus of the title by making one consider some of the oddness of what we eat. Anuj Shrestha's "Foodies" is a creepy little tale of what people might actually be getting from the closed-off kitchens of gourmet restaurants, featuring nicely-realistic art that makes the twist that much more disturbing. Sungyoon Choi's "Piggy Piggy" is a short series of dreamlike images involving the eating of pigs. Neil Brideau's "Tell Now, the Tale of the Argus Mushroom!" is a neat sci-fi story in which some alien(?) kids learn about how a scientist ancestor of their tribe used a certain mushroom to genetically engineer them into dominance, with a funny punchline that once again ties into the theme of the inherent weirdness of eating. Jonas Madden-Connor has a quirky story about a resident of the future imagining himself as a 21st century woman (or is it vice-versa?) who doesn't have to eat through a tube. 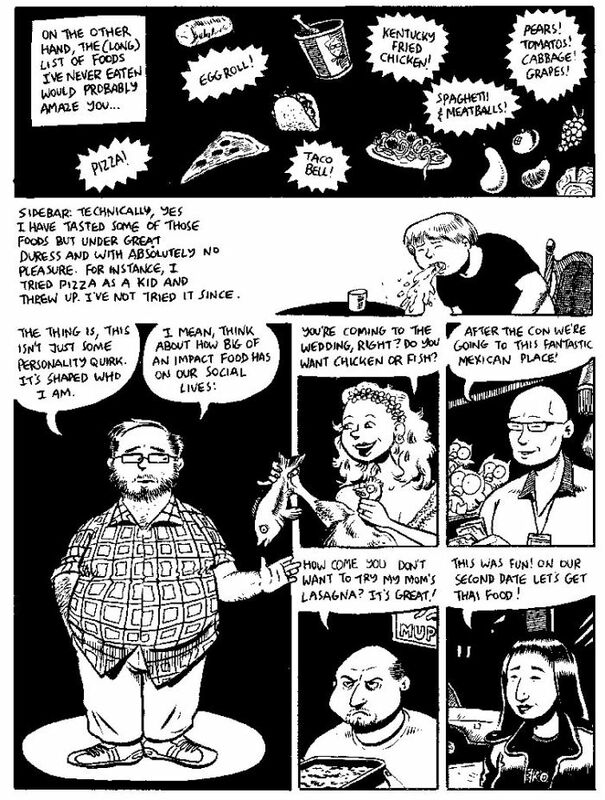 Jeff Zwirek contributes a short gag strip about a caveman and his mate that features some nice, thick linework. 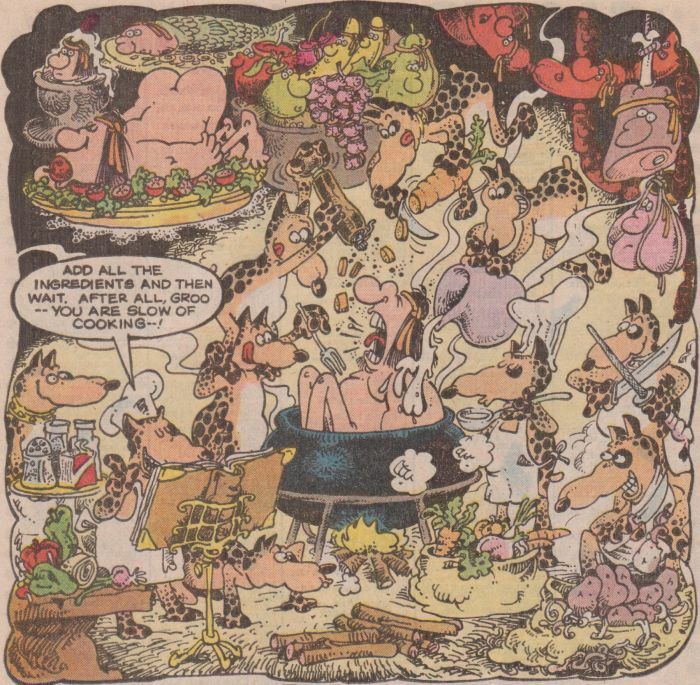 And Box Brown's "When Cows Ran Free: 1000 Years After Meat" is a quick glimpse of society in a meatless future, which is only slightly different from our present aside from the games kids play with each other. 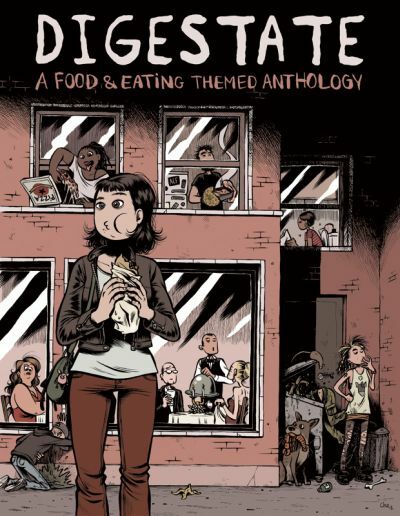 As entertaining as all of those stories can be, the last category, featuring journalistic stories and pieces in which the creators confront themselves or the reader about the morality of what they eat, is the real highlight of the anthology. 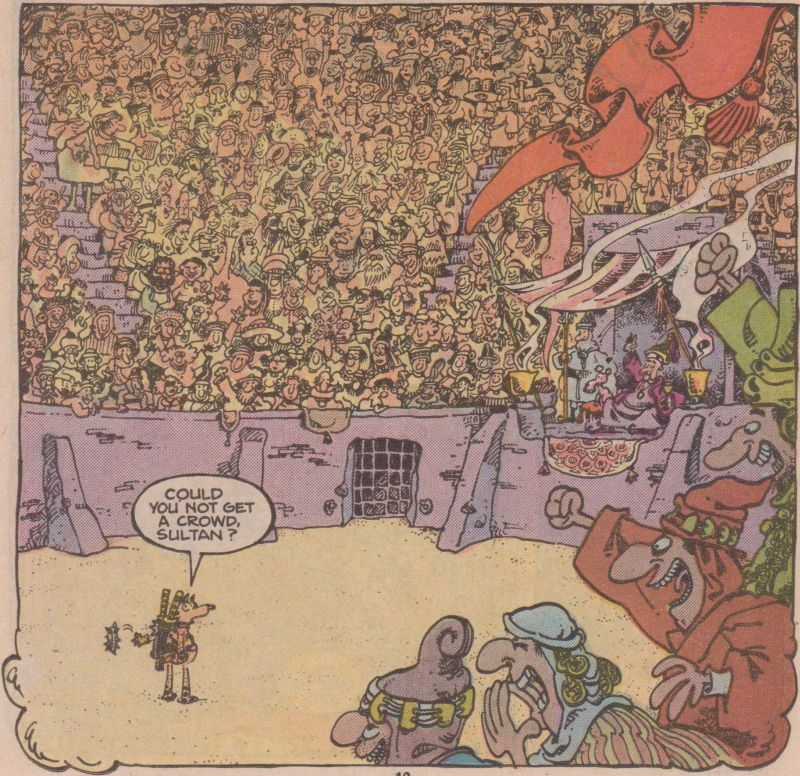 French cartoonist Cha (who also drew the cover) contributes two stories featuring a character called Gwenaelle the Baby Sitter, who torments her charges with the hard truth about the suffering of animals on farms. She kicks off the book with a recasting of "The Three Little Pigs" as piglets who are born on a cold factory-farm floor before running off to escape the "Big Bad Farmer", who eventually captures them and has them mercilessly butchered; she ends the book with another tale of the horrible lives of dairy cows. It's incredibly expressive, cartoony work, creating cute, lovable animals whose deaths are especially disturbing. Other "advocacy" or journalistic stories include C.M. Butzer's "20 Billion Chickens", which looks at the huge number of chickens on the planet, the vast majority of which are raised in inhumane factory farms; and Jess Ruliffson's "City Chickens", a nice, naturalisically-illustrated piece about a community garden in New York City that raises chickens. A couple of the autobiographical stories overlap with this category as well, such as K. Thor Jensen's story about how accidentally severing two of his young daughter's toes opened his eyes about the reality of meat, or James Kochalka's spiritual attempt to justify the morality of eating meat in his inimitably open-hearted fashion. But the best piece by a long shot is J.T. Yost's "Slaughterhouse Stories", a testimony from a long-time employee of the John Morrell company who details, in excruciating fashion, the awful things that go on inside a slaughterhouse. Interestingly, Yost holds off on levying vegetarian outrage at the barbaric nature of the proceedings, letting "Craig's" words tell the tale of how corporate greed not only encourages animal suffering, but also endangers human life by insisting on keeping up a pace that all but ensures that hogs are brutally beaten, improperly stunned, bled out while alive, and eventually drowned in boiling water. The cost-saving measures that the higher-ups in the company took to increase production are horrifying in their callousness, making the employees struggle to do an already-dangerous job while keeping constantly on edge in case live animals get loose and cause injuries. Yost stretches the story out to an exhausting length, filling the pages with large images and stark text, but not sensationalizing the subject as much as he could have with blood and gore; instead, he mostly limits the ever-present blood to dark splotches of ink that suggest the horror rather than shove it in the readers face, and focusing as much on the workers' exhausted faces and some of the darker implications like the alcoholism and abusive relationships that many men fell into after killing thousands of beings each day. It's a hard-to-read story, but it's not a preachy one, leading readers to the conclusion that while eating meat might not be morally wrong, holding life both human and animal at such a low value certainly is. Yost's story alone is worth reading this book for, but all in all, it's an impressively rich collection of comics that covers a wide variety of well-known and under-the-radar creators, with material that is funny, thought-provoking, beautifully drawn, and well-written. As a successful project that resulted from the ever-growing method of crowdfunding (via Kickstarter), it's a sign that the vast pool of comics-making talent is deep and wide, and given the chance to collaborate toward a theme, can deliver quality comics in spades. If this is the kind of book that results when such creators work together, the future is bright indeed. They eventually determine that the reason the princess has trouble finding a husband is that she insists on marrying for love, but once she realizes the true identity of her suitor, she decides to marry him after all in order to teach her father a lesson. 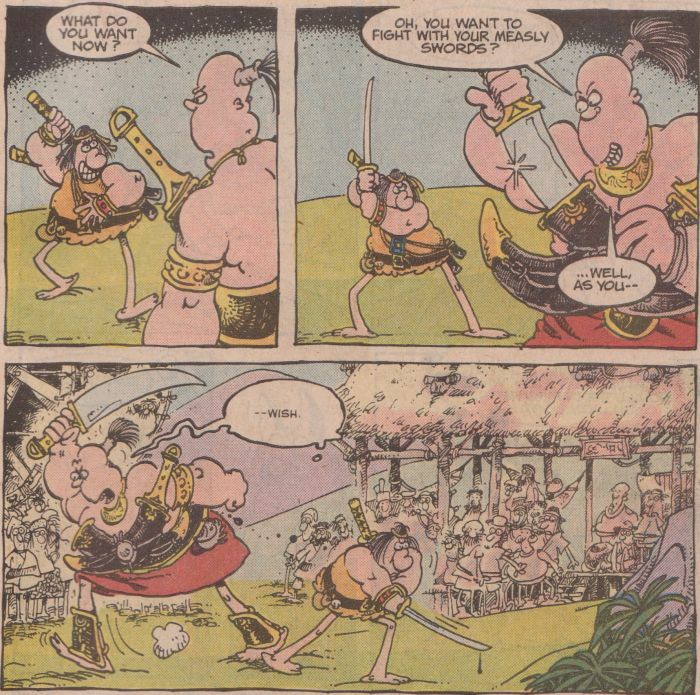 Unfortunately, none of the various parties have learned how fruitless it is to base any plans around Groo, and he manages to ruin everyone's schemes all at once in a moment that the episode builds to perfectly, allowing for a great example of the "everyone angrily chases Groo" ending. It's a pretty great example of the mastery of structure that the creative team has acquired, and a good sign for the series' future, as it settles into a groove of excellence. More, please. 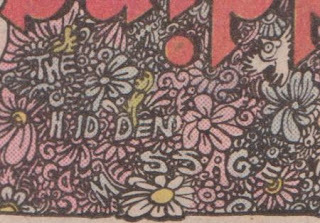 In fact, in another panel on that page, the text in the Bible says "How many hidden messages did you find in this comic? Ha ha ha," so maybe there are more I missed. Moral: "He who marries for money never marries for real." I don't remember if that one continues beyond this issue, but it might. There's also a mulch reference. 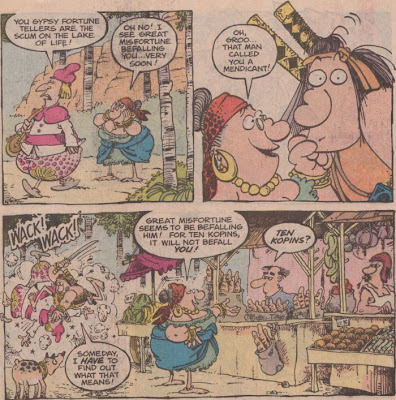 Letter column jokes: In response to a request for a second Groo title, Mark announces The Groo Chronicles, which repackaged the pre-Marvel Groo stories. He says there will also be "some new stuff," but I never bought any of those issues, so I don't know if that's true. 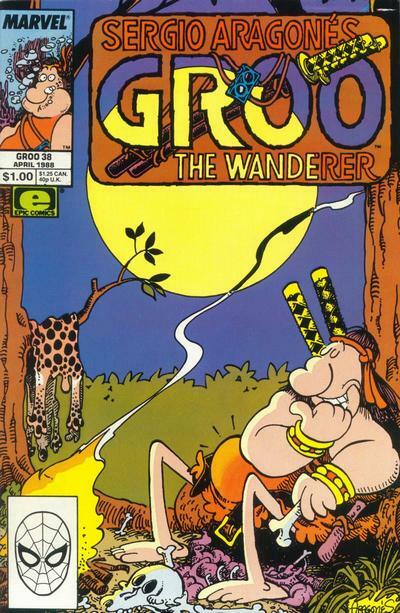 A list of numbered questions from reader Tracy Abbott includes one asking why people say they have a complete collection except for a certain issue, which prompt Mark to joke that Groo is unique in that collections of the series go up in value according to how many issues are missing (he also claims this is a "cheap switch on an old joke about winning a week's vacation in Philadelphia). Tracy also asks why people write and why they think their letter will be printed, so Mark talks about the huge amount of mail they receive, "some of it even not from Steven W. Ebner." He describes how the letters are received, read by Mark and Sergio, and then retyped for publication by Mark's associate Tracy Abbott, realizing in the middle of a sentence who the writer of that particular letter is. 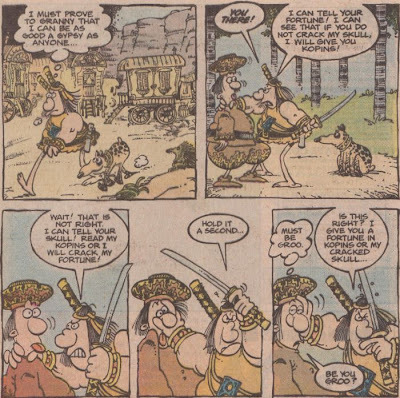 Finally, in response to a reader named James Troesch who says he wants to be just like Sergio, Mark claims that he and Sergio bring great shame to their families by creating Groo, and James should learn from their mistakes, maybe even being lucky enough to someday be someone who doesn't read Groo. It might be due to living in more "sensitive" times than the era in which this comic was created, or it might be because an increase in global awareness has brought into view the plights of people who Americans might not have realized existed, but this issue is kind of uncomfortable to read, dealing as it does with Gypsies of the stereotypical variety, the kind who tell fortunes, lie, cheat, and steal from everyone they encounter, then travel away in their wagons before they can be punished. That might seem like using a character type out of an old storybook, but it's actually racist imagery targeting the Romani people, and while it might not have been offensive back in the 80s (at least, not in the United States; the issue was probably more visible in Europe), it certainly is today. 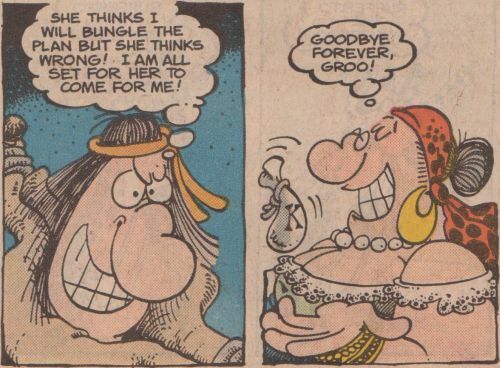 It's an unfortunate aspect of the story that colors what should be a touching reunion between Groo and his old caretaker, who is known only as Granny Groo. 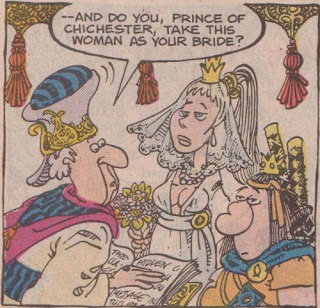 She's apparently Groo's actual grandmother, or at least a relative, considering that she shares his and his sister Grooella's distinctive nose, and she seems to share a familial (or maybe it's just societal) contempt for her grandson, constantly referring to him with mean names like "my little rhinoceros-faced whelp" or "my little fish-faced jackass", and attempting to use him in her schemes to cheat people out of money, and then spanking him when he inevitably fails. 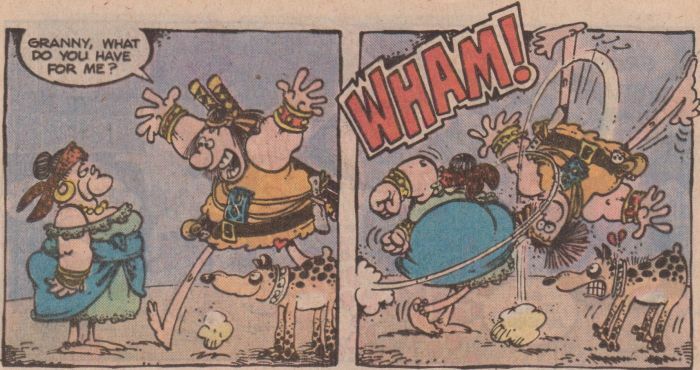 Groo attempts to remember his childhood with her fondly, allowing for several flashbacks to his childhood with her, but every memory ends with a spanking; hopefully he'll realize the extent of the abuse in this relationship and part ways with her soon. 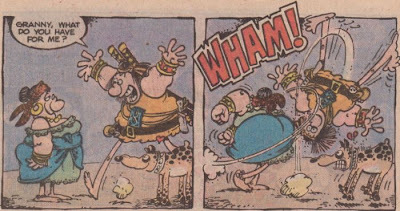 This is kind of funny, but it's also disconcerting to see her taking advantage of Groo like this. Sure, lots of people in the series have also tried to manipulate Groo to their own ends, but few have done it through exploiting his affection for them while still treating him so badly. 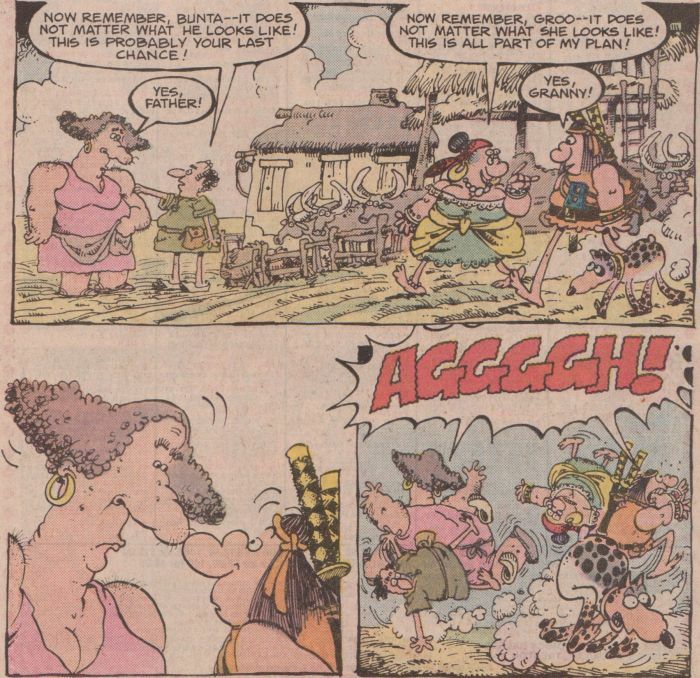 Granny Groo does get some comeuppance, as would be necessary to follow the rules of the series, but it's not as satisfying as it could be, especially due to the ugly stereotypes that persist around her and her people. 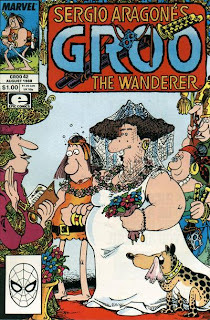 Next: "The Weddings of Groo"
Moral: "You are never too old to have your seat tanned by your grandmother." Spanish words: The towns of Cebolla and Ajo are named after the words for "onion" and "garlic". 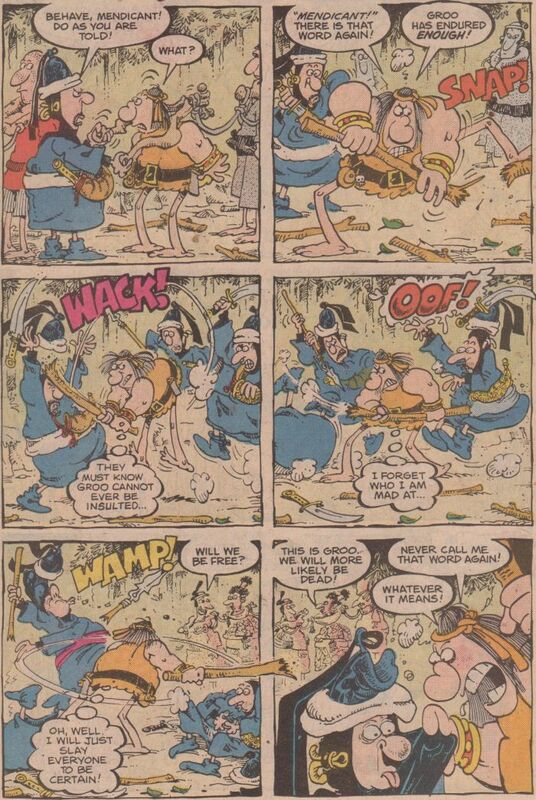 Running jokes: Granny Groo gets Groo to beat up a guy by saying the guy called him a mendicant. 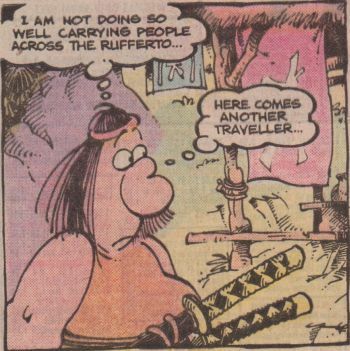 Groo and Rufferto demonstrate their atrocious eating habits. Letter column jokes: Two readers write in with numbered lists of questions, and Mark answers them, but doesn't number his answers, which makes for amusing paragraphs of short, clipped sentences like "Because they're stupid. It doesn't have one. ... .She'll be back" and so on. Reader Mike Wallace supplies what he says is a list of ten facts about himself, but only includes nine items, and includes "You are going to print this letter" twice. And, in what I think kicks off a long-running letter column joke, Mark says that Sergio only has half a moustache. 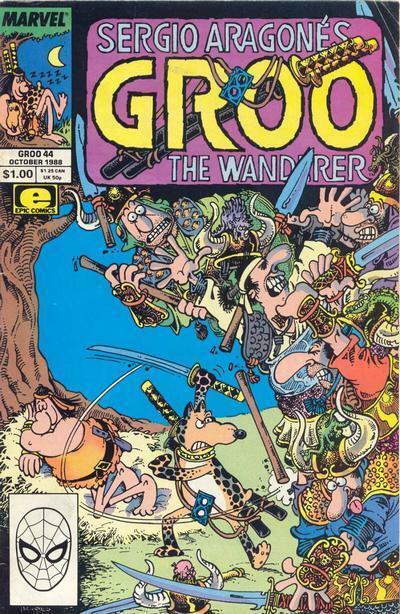 That's kind of a goofy cover; it seems to be acknowledging that Rufferto has permanently joined the cast, but the panels he's mugging in front of aren't connecting, instead seeming to stand in for moments in the issue's story (Groo crying about losing his dog and getting into fights, Pal and Drumm yelling at some guys). I do like the scene in the lower left though, with the guys making fun of the UPC box (or a picture of Spider-Man's mask, which is what's on my copy). 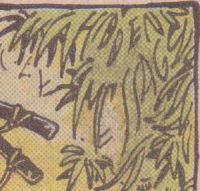 I was also amused by the other ferryman in the first panel, who is distracted by the burden resting atop his head. 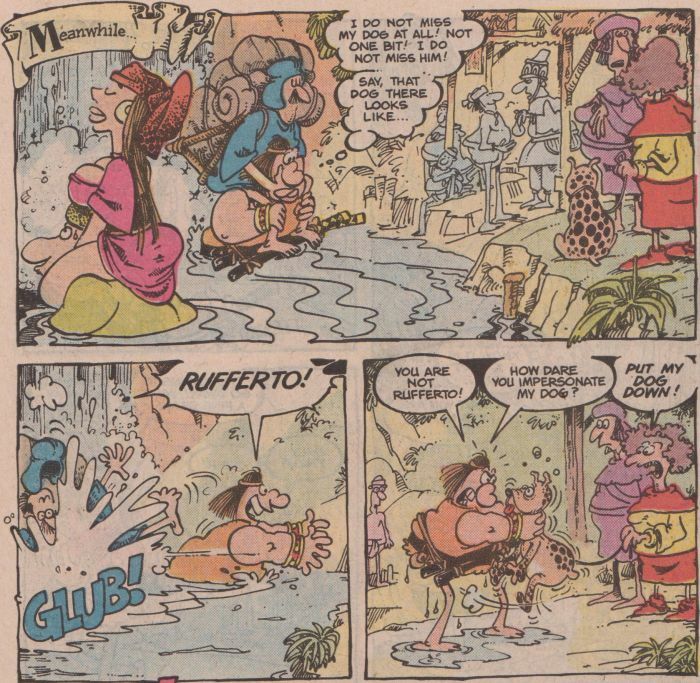 It all makes for a fun issue, one that cements Rufferto's place in the comic as something of a humanizing force for Groo. 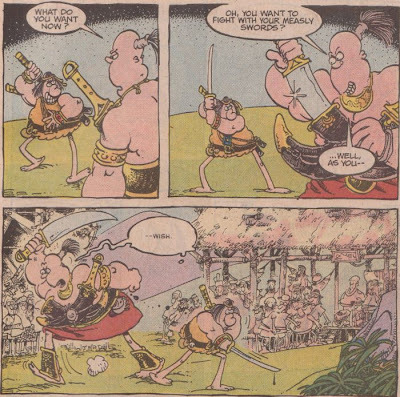 As dumb and prone to erring as Groo is, his life can seem like an endless succession of low points, but having someone who loves him no matter what adds a sort of audience surrogate to the comic, somebody who has affection for that most hated of individuals, someone who wants nothing more than to accompany him along on all his journeys, no matter how much trouble he gets in. Plus, it gives Groo a chance to act positively toward someone, rather than just following his own desires, which usually conflict with pretty much everyone else, even those who would seemingly share them. 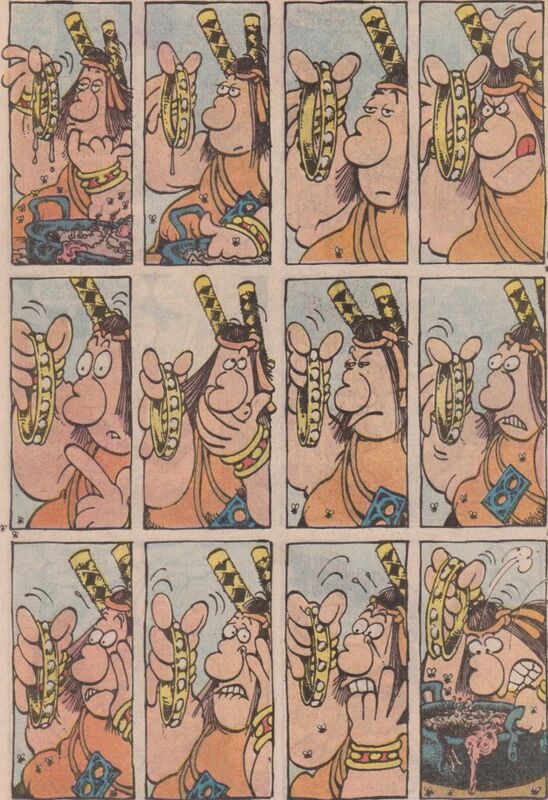 It's beneficial to the comic all around, and I wouldn't have it any other way. 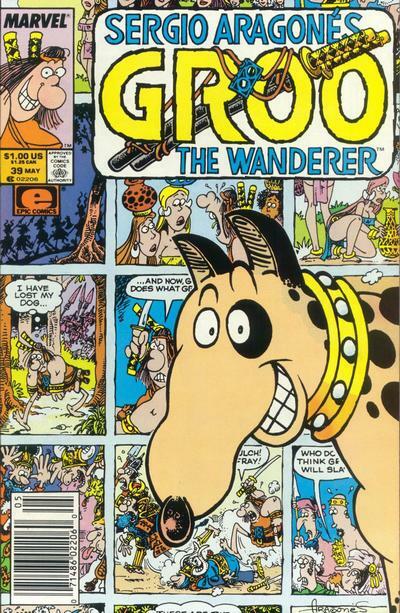 Next: I don't currently appear to own issue #40, so next up will be issue #41, "Granny Groo". 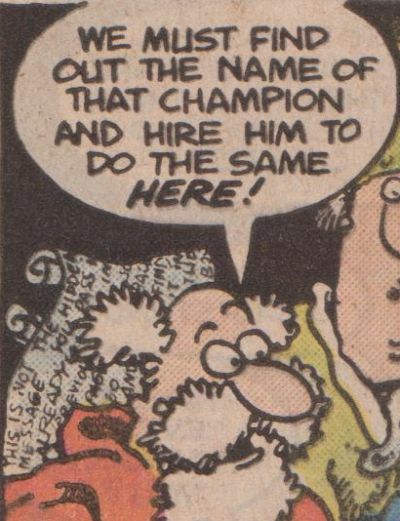 Recurring characters: Pal and Drumm, and Rufferto's former owners make an appearance. Moral: "The best thing about being apart is getting together again." 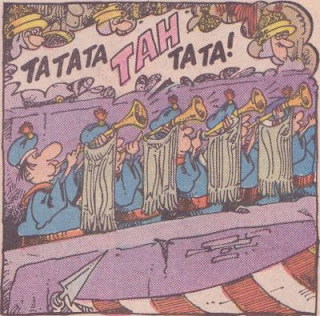 Running jokes: This is the origin of the "What pirates?" gag that recurs in every Pal and Drumm appearance from here on out, with Drumm constantly bugging Pal about some pirates which the latter made up who supposedly kidnapped Rufferto. There's a mulch joke on the cover, being one of the words Groo is shouting out as he charges into battle in one of the panels. Letter column jokes: Reader Chris Mascotto asks what is so funny about mulch, since he only started reading the series with issue #22. Mark says there is absolutely nothing funny about it, but it's kinda funny that people keep writing in and asking about it. Later, when another reader asks him to define mulch, Mark suggests he write to Chris Mascotto for an explanation. Reader Bryan Povich says he doesn't understand why they keep publishing Groo, since it is only about laughs, and "that makes it a cartoon". He says he outgrew cartoons a long time ago and thinks they should too and move on to "real comics" like X-Men and New Mutants, which "show real people with real problems." Mark says they're even; he doesn't understand why they publish Groo, and they don't understand why he buys it. Finally, reader Sergio Valentez describes a friend named Tim Ficke who is so obsessed with Groo that he got a dog that looks like Rufferto, wears a headband, and is trying to find a Groo outfit. Mark replies that getting a dog that looks like Rufferto is not a good sign, but eyeing the dog hungrily is a worse sign. A Wrinkle in Time: Is this story that old? I read this novel years and years ago, but I had very little memory of it, aside from the explanation of the title, a plot point involving the little brother character, and a vague sense of odd pseudo-Christian stuff creeping in at the edges. 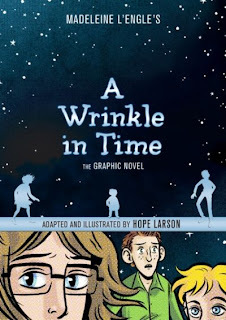 Hope Larson's new adaptation of the book, which is coming out just in time for its fiftieth anniversary, makes for a good chance to revisit it and see how well it holds up, as well as how it fits into the current rich landscape of young adult literature. Regarding the former question, it seems to work well enough, creating well-drawn characters, immersing them in a fantastical world, and giving them goals that are both impossibly huge (fighting a universe-spanning evil force) and relatably intimate (rescuing their missing father). There are some interestingly strange concepts, including beneficial billion-year-old creatures who can manipulate time and space, a scary giant brain of a villain, and an evil black cloud entity of some sort that, in addition to spreading across and consuming the universe, is behind all the pain and suffering on Earth. The image of a planet where inhabitants are forced to adhere to restricting conformity is reminiscent of the threat of Communism that would have been pervasive at the time of the book's original creation, but it's still a powerful image, no matter the era. It's an interesting work of science fiction, with a spiritual emphasis on the power of love, which, depending on one's tolerance for that sort of touchy-feely stuff, lands somewhere in the middle of the spectrum of effectiveness between a powerful look at human emotion and a tiresome slog through sappy feelings. As for the book's status alongside its modern-day peers, it does seem a bit old-fashioned, lacking the blistering pace and hormone-addled romance that the likes of The Hunger Games or Percy Jackson use to reel in readers. This story seems much more lackadaisacal, spending a good portion of the book introducing the awkward Meg Murry and her relationship with her family (especially her weird little brother Charles Wallace, who seems to be a super-genius and/or a leap forward in human evolution), then slowly revealing the three strange old ladies who live in a shack near their home before finally letting the space-traveling, evil-battling, father-rescuing plot kick in. And even when that gets going, a lot of it is spent enumerating the details of the worlds and aliens that Meg, Charles Wallace, and their friend Calvin encounter, with their eventual heroic rescue being something of a quest that the ultra-powerful fairy-godmother aliens send them on after pulling one of those "We can't interfere; this is something you have to do yourself" moves that ensures the protagonists are the heroes of the story rather than the advanced beings who seem like they could solve the universe's problems much more quickly and effectively. All that said, the novel is a classic for a reason, and it's very effective at creating appealing characters and dropping them into a mind-boggling situation, then letting them use their wits and emotional strength to get out of it. What's at question here is how well Hope Larson can adapt this all to comics, and fortunately, she's a great match for the material, using her wispy, ethereal sensibilities to great effect. She makes Meg a believable, relatable teenage girl and fills out her home and family around her so well that the sudden journey to the cosmos makes for a surprising departure from the down-to-earth locales of the book's beginning. And once things are off and running, Larson comes up with effective ways to convey the disorientation of interdimensional travel, as well as the weirdness of alien worlds and the creepiness of the sterile planet Camazotz. It's lovely work, selling the basics of human interaction like Meg's feeling of teenage awkwardness or the way Charles Wallace seems a bit "off", but also conveying the characters' feelings of awe when confronted with the marvels of the universe and the terrifying scale of the evil they face. It's a really nice-looking book; Larson has done a great job of bringing it to life in comics form, using a two-color palette that adds a cool blue tint to the black and white linework. For any long-time fans of the novel or readers who want to catch up with a well-regarded work of YA lit, this is a can't-miss prospect. Whatever reservations I may have about the religious elements that creep in or the sometimes antiquated approach to storytelling, the book overcomes them with pure strength of feeling, an investment in likeable characters who face a near-incomprehensible threat that becomes surmountable through the familial love that we can all (hopefully) understand. 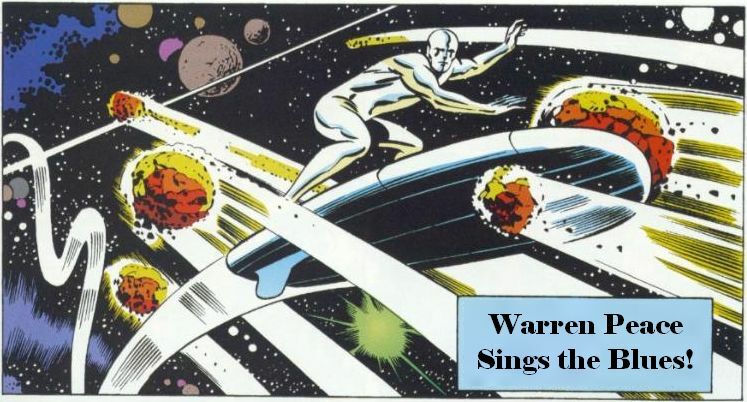 That's something worth experiencing, and with Larson's skill at graphic storytelling, it's great that this beloved work can find a new audience in a new medium. 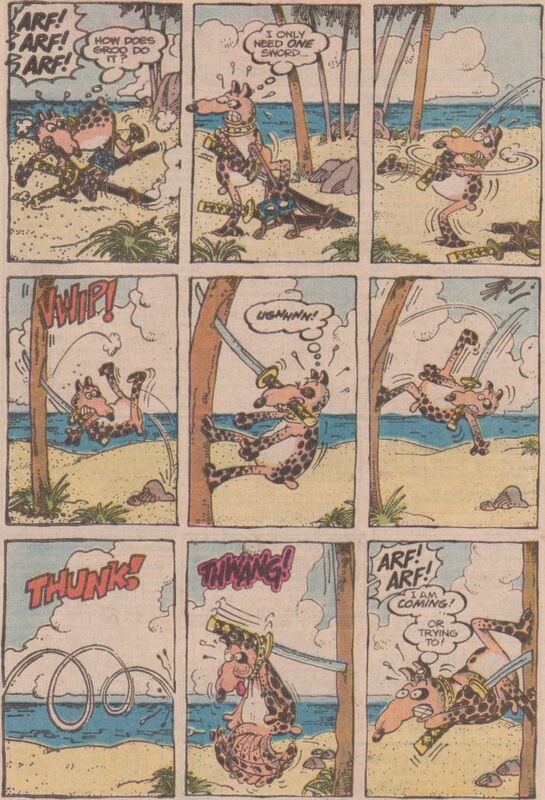 I always like a scene of Groo trying to figure something out, but that one is especially effective, with the segmentation of the page into so many small panels really emphasizing the amount of time it takes for a bit of information to get through his thick skull. 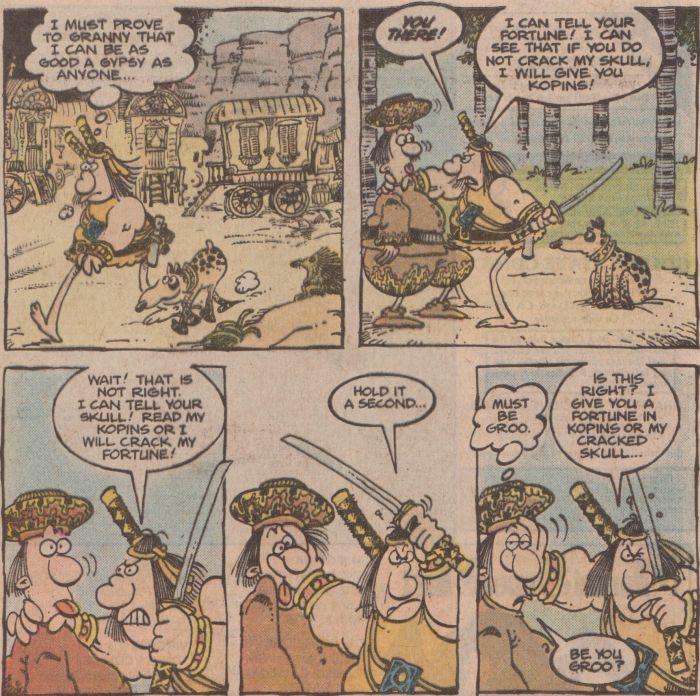 The rest of the issue works as background to this ongoing display of emotion, full of the usual shenanigans, as Groo is tasked with recruiting a new army for a general after he slays or injures all of his current soldiers. He ends up rounding up some men, but still manages to ruin the general's plans, even though he's constantly distracted by his grief. 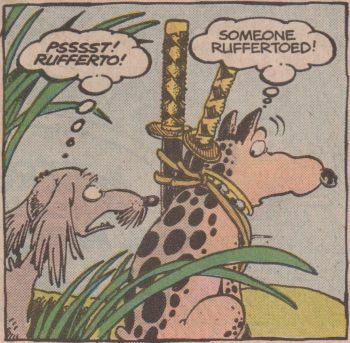 And even though he manages to stumble right into the path of Rufferto's kidnappers, he's too dumb to figure out what had actually happened, so the tearful reunion is delayed until the next issue. Whatever happens, it's sure to be funny. Next: "A Groo's Best Friend"
Recurring characters: The Sage appears in Groo's dream, as does a version of Rufferto dressed as the Minstrel. Moral: "You never know what Love is until you lose it." 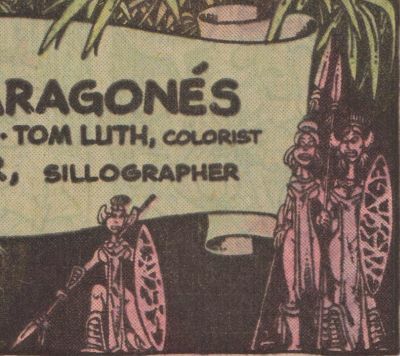 Spanish words: Pelon, the general, has a name which is Mexican slang for "bald guy" (we never see him without a hat to find out if it's apropos). Tazon, the city Pelon wants to conquer, means "bowl"
Running jokes: This seems to be the end of the jokes about Groo eating Rufferto. Groo would prefer to dream of frays or cheese dip. In a variation on the "slow of mind" joke, the Ruffertos in Groo's dream call him "slow of cooking".